Brief History of the Diocese of Limerick by Fr. John Leonard service booklet for the installation of Bishop Donal Murray in March 1996. 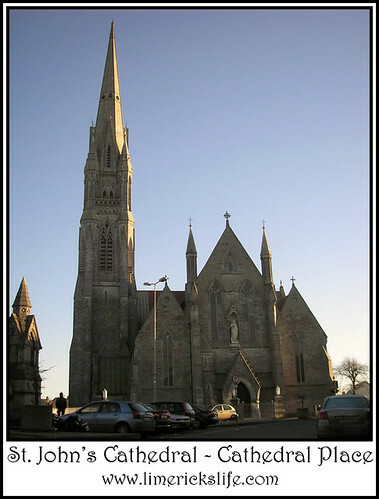 St. John’s Cathedral is the Seat of the Diocese of Limerick. The present day cathedral is built on the site of the old eighteenth-century one. Constructed between 1856 and 1861 under the supervision of architect Philip Charles Hardwick the Cathedral incorporates a tower with a 280 foot high spire. The building was consecrated by Cardinal Logue in 1894. Though the shadowy figure of the seventh century St. Munchin is its patron, the Diocese of Limerick actually dates from the twelfth century when its boundaries were laid down at the Synod of Ráth Bressail. It is unlikely that any diocesan structure had existed prior to that time and the local bishops would have been members of the monastic communities in the area. While they would have had some prestige deriving from their office, it was the abbots who held power and were the administrators of the church system. The Vikings were primarily responsible for the establishment of a diocesan system in Ireland and the city of Limerick played a leading role in that development through the work of its first bishop, Gilbert. He was initially consecrated as a bishop for the city and subsequently took charge of the diocese when it was formed in the year 1111. One of the most remarkable figures of our diocese is that its boundaries have not changed significantly since that time and were in turn based on an older territorial division, a Munster sub-kingdom ruled by the Ui Fidgente kings. On his death in 1145 Gilbert was succeeded by Bishop Patrick, who probably took his name at his consecration and may have been of Viking ancestry, as indeed Gilbert probably was. The next bishop, of whom we have record, is Brictius. He took part in the Synod of Cashel in 1172 and also represented Limerick at the third Lateran council in 1179. It is of interest that he travelled to Rome with St. Laurence O’Toole, the first canonised Irish saint. The Black Book of Limerick, a manuscript transcription of various medieval documents relating to the diocese, provides valuable information for that period. In 1201 and enquiry was held into the ecclesiastical property of the diocese. The jury who conducted this survey was made up equally of Irish, Norman and Viking members indicating the cosmopolitan nature of the diocese at that time. This invaluable list of early thirteenth century churches is printed and discussed in Begley’s history of the diocese. In a taxation return for 1302 we learn for the first time that the diocese had been divided into deaneries and a proxy tax of 1418 gives another list of churches which affords a valuable comparison with the situation in 1201. It is to Cornelius O’Dea, bishop from 1400 to 1426, that we are indebted fort he two great treasures of the diocese, the O’Dea Mitre and Crozier. He was also responsible for the compilation of the Black Book, which was returned to its rightful home in the diocese during the recent episcopate of the late Bishop Newman. At the reformation Bishop John Quin, a Dominican priest from Kilmallock friary, accepted the limited changes of King Henry VIII, as his successor Bishop William Casey did the Lutheran system of Edward VI. Following the restoration of papal links under Queen Mary, Casey was dismissed and Hugh Lacy, a member of the prominent County limerick Anglo Norman family was appointed. He remained in office until 1571 when he was removed by Queen Elizabeth and William Casey was restored as the new Anglican Bishop. It is from this date that the final cleavage occurred and henceforth there were to be separate bishops for the Catholic and Anglican dioceses. Bishop Lacy died in 1580 and two years later the Holy See appointed Cornelius O’Boyle as bishop. He was then in Spain, where he appears to have remained until his death in 1597. Limerick was without a bishop for a further twenty years until Richard Arthur, who had been vicar general, was appointed. On his death in 1646 he was buried in Sr. Mary’s Cathedral which had come into catholic hands during the Confederate wars of the 1640’s. His successor, Dr. Edmund O’Dwyer, undertook a re-organisation of the diocese and his report of Rome in 1649 gives a valuable insight into the situation at that time. He survived the siege of the city by Ireton in 1650 and after the surrender escaped to Brussels where he died in 1654. The difficult period of the Cromwellian regime was succeeded by a more tolerant approach after the restoration of Charles II. In 1677 a new bishop, Dr. James Dowley was appointed. Two years later he sent an optimistic report to Rome on the state of the diocese. Education was flourishing with schools in every parish and a weekly sermon on Sundays. He established two confraternity in the city and visited each parish in the diocese and ordained priests regularly. Even during the brief persecution occasioned by the Popish plot scare he was not hindered in his episcopate and lived until 1658 which saw the catholic monarch James II ascend the throne. Dr. John O’Moloney was transferred from the see of Killaloe to Limerick in 1689 but he left for the continent before the 1690 siege and the administration of the diocese was, during the tumultuous period of the sieges and the treaty of 1691, in the hands of his cousin, Dr. Matthew Moloney and Dr. James Stritch, vicars general. The diocese was again without a bishop during the early years of the eighteenth century when much anti-Catholic legislation was passed by the Irish parliament. A new bishop, Dr. Cornelius O’Keeffe, was eventually appointed in 1720 and he managed to administer the diocese successfully despite the legal restrictions. In the 1780’s, during the episcopate of Dr. Conway, a report to Rome on the state of the diocese shows that the church did not suffer as severely under the penal legislation as is often supposed. The diocese was divided into four decantes each presided over by a vicar Forane who held a conference of his priests once a month. The forty parishes of the diocese each had a chapel with at least basic facilities and there was no shortage of priests. The mass rocks of popular folklore were clearly not the normal location for the Mass. The chapels in the five city parishes were larger and more ornate. There were no convents of nuns and the report notes with concern the refusal of some clerical students to return to the diocese after their ordination at continental colleges. In 1825 Dr. John Ryan from Tipperary, was appointed coadjutor bishop with the right of succession to the elderly and infirm Bishop Charles Tuohy. The grant of Catholic emancipation in 1829 revitalised the church in the diocese and during the long episcopate of Bishop Ryan and those of his successors, bishops Butler and O’Dwyer, there were major programmes of church building, parish reorganisation, liturgical innovation and spiritual renewal. Their record of achievement and commitment to the diocese has been continued and expanded by their twentieth century successors-in our own time, by bishops Murphy and Newman-in the see established by Gilbert more than eight centuries ago. PreviousMcAdam the Traitor, who betrayed the Irish.